1Press Ctrl+H to summon the Find and Replace dialog box. 2Click the mouse in the Find What text box and press the Delete key. 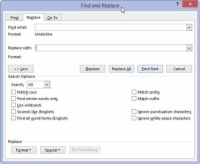 All text must be removed from the Find What text box. 3Click the More button, if necessary, to display the full dialog box. You may or may not need to display the full box. 4Click the Format button and choose Font from the pop-up menu that appears. The Find Font dialog box appears. 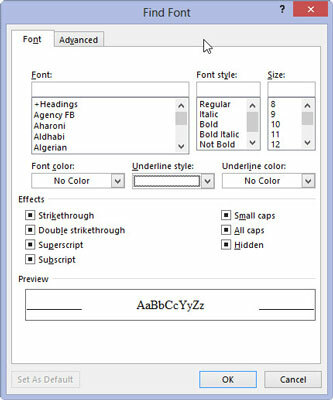 5In the Find Font dialog box, choose the single underline graphic from the Underline style drop-down list, and then click the OK button. 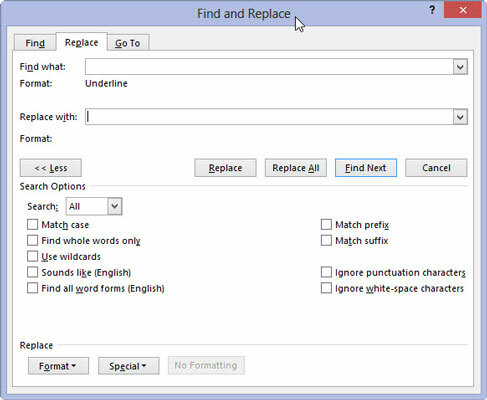 Back in the Find and Replace dialog box, the text Format: Underline appears below the Find What box. 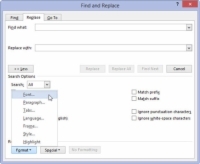 6Click the Replace With text box and press Backspace to delete that text. 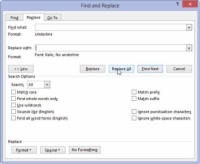 Any text in the Replace With text box must be erased. 7Choose Font from the Format button's pop-up list. 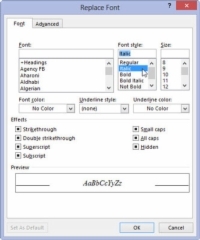 Choose a font from the options listed. 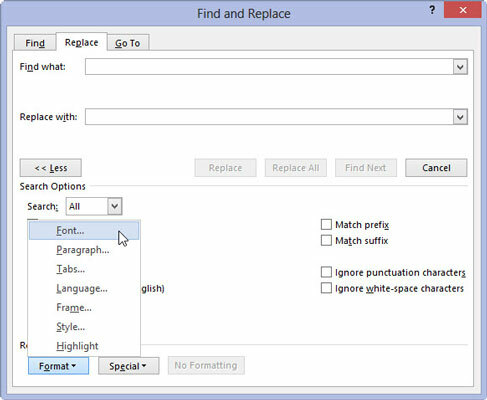 8In the Replace Font dialog box, choose (None) as the underline style. 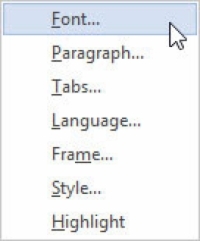 This step is necessary because, otherwise, Word wouldn’t remove the first style; it would merely add to that style. Likewise, text attributes such as Not Bold and Not Italic are found in the Replace Font dialog box. 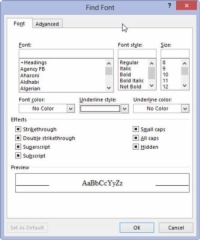 9Choose Italic from the Font Style list, and then click OK to close the Replace Font dialog box. Below the Replace With box, it should say Format: Font: Italic, No underline. That means Word will search for underlined text and replace it with italic text and remove the underline. 10Click the Replace All button. Word scours your document and replaces any underlined text with italic. 11Click OK when the find-and-replace is done. As long as you set things up carefully, searching and replacing text formatting is a quick and easy way to spiff up a boring document. To replace one format with another, such as underline with italic, be sure to leave the Find What and Replace With text boxes empty. That way, only the text formatting is replaced. An easier way to update formatting in a document is to use and apply styles. Don’t forget about the No Formatting button! You need to click it if you want to change the formats or replace text without paying attention to formats.